With a 5.7L V8 HEMI engine, the new Ram 1500 reaches 10,620 lbs of towing capacity, enough to tow jet skis and many campers. When outfitted with an efficient 3.0L V6 EcoDiesel engine and an 8' bed, the Ram 1500 produces up to 9,210 lbs of towing capacity. The Ram 1500 starts with a 3.6L V6 gas engine that will meet the needs of most buyers. It can tow up to 7,600 lbs. Features like Hill Start Assist, and Integrated Trailer Hitch, and Trailer Sway Control all contribute to a confident towing throughout Aransas Pass, TX. 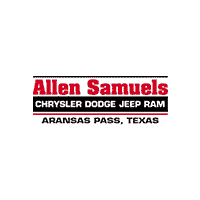 Experience the well-reviewed Ram 1500 in person by scheduling a test drive at Allen Samuels CDJR of Aransas Pass. Explore the Ram 1500 features before visiting us, including the RamBox Cargo Management System. We can even help you lift your truck, and be sure to check out our new vehicle specials before you visit our showroom.